CLEVELAND: Kyrie Irving scored 32 points and made two critical layups before leaving with a leg injury and Kevin Love scored 30, helping the Cleveland Cavaliers hold off a late rally for a 124-118 victory over the Boston Celtics on Thursday night. 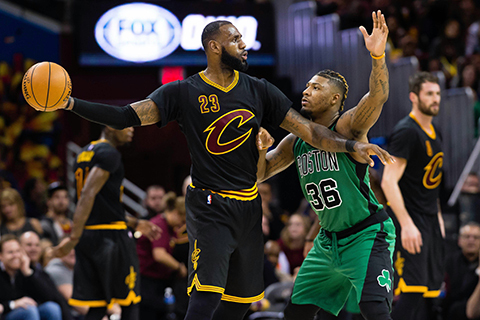 The Cavs led by 20 points in the third and 17 early in the fourth but couldn’t close out the Celtics, who pulled within one point three times in the final two minutes. Irving, though, came up with his big baskets and the Cavs had to fend off Boston over the final 53 seconds as their star guard grabbed his right hamstring and went to the bench. His injury did not appear to be serious. LeBron James had 23 points and 11 assists for the Cavs, who won for the 11th time in 13 games. The only two losses during that stretch came at Memphis and Detroit – games James sat out. Isaiah Thomas scored 31 and Avery Bradley had 23 but both players were on the bench when the Celtics kept chipping away in the fourth. Marc Gasol scored 25 points and Memphis took advantage of Russell Westbrook’s ejection, dominating Oklahoma City. Westbrook, the NBA’s leading scorer at 31.7 points per game, scored 21 before he was tossed midway through the third quarter when he was whistled for two quick technicals. At that point, Memphis already held a double-digit lead that reached 37 points in the fourth quarter. Zach Randolph added 21 points for the Grizzlies. He and Gasol both grabbed eight rebounds. Memphis reserve Troy Daniels shot 6 of 8 from 3-point range in the fourth quarter and scored all 22 of his points in the final period. Enes Kanter had 19 for the Thunder, and Alex Abrines scored 10 as Oklahoma City set a season low for points. Westbrook had five rebounds and no assists. Eric Bledsoe scored 22 points and Devin Booker had nine of his 19 in the fourth quarter, helping Phoenix beat Toronto. The Raptors, in second place in the Eastern Conference, lost consecutive games for the first time since Nov. 20 and 21. Both teams played the second of back-to-back games, with the first being on the road. The Raptors trailed for most of the second half and cut a 14-point deficit to 90-85 on a layup by DeMar DeRozan with 3:25 to play in the fourth quarter. But the Suns hung on, winning for just the second time in eight games. They have won back-to-back home games for the second time this season. DeRozan and Kyle Lowry scored 24 points apiece for the Raptors. Nicolas Batum had 16 points, 13 rebounds and eight assists, providing a spark during a big third quarter that carried Charlotte over Miami. The Hornets outscored the Heat 31-17 in the quarter to take command, with Batum contributing nine points, five rebounds and four assists in the period. Kemba Walker led Charlotte with 22 points. The Hornets improved to 19-14, and have won five of their last six games. Josh Richardson led Miami with 20 points on 8-for-14 shooting. The Heat fell to 10-23. The Hornets’ third-quarter dominance has become habit. One night earlier, they outscored the Orlando Magic 35-13 in the period to grab a lead they held onto until the end. George Hill had 21 points in his return to the lineup after missing 13 games with a sprained toe, and Utah blitzed Philadelphia in the fourth quarter. Gordon Hayward and Rodney Hood each added 20 points for the Jazz (20-13), who outscored Philadelphia 30-9 in the final period. They shot 58 percent from 3-point range overall to win their second consecutive game after dropping three in a row. Ersan Ilyasova scored 16 points and Nerlens Noel and Dario Saric both added 14, but the anemic fourth-quarter performance contributed to the 76ers’ fourth straight loss. Philadelphia, playing without leading scorer and rebounder Joel Embiid, surprisingly led for most of the game before the fourth-quarter collapse. The 76ers shot 4 for 23 in the final 12 minutes.